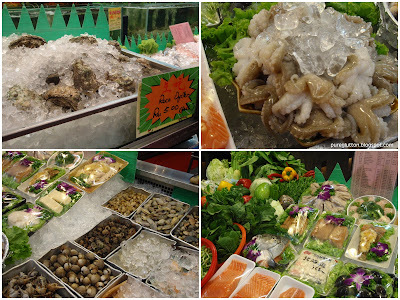 Recently we took a short break for a makan trip to Penang. It’s been several years since we last drove there. 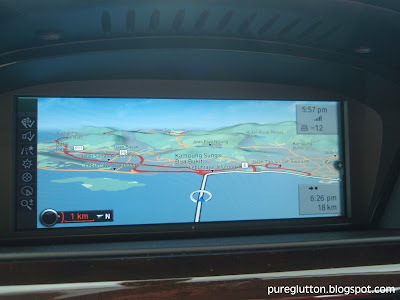 So, when we were finally crossing the Penang Bridge, I couldn’t help clicking the above pic from the screen of my car’s GPS. 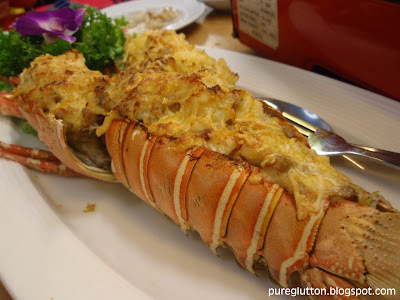 By the time we reached Gurney Drive, it was dinner time. 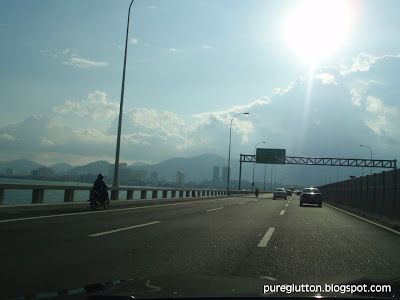 We didn’t realise Friday evening traffic in Penang can be that bad, kinda underestimated it! 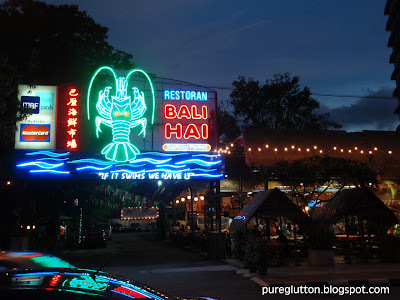 So, on DL’s friend’s invitation, we headed to Bali Hai at Gurney Drive. The other Bali Hai which I know well happens to be a Dive Centre in Tioman, haha! 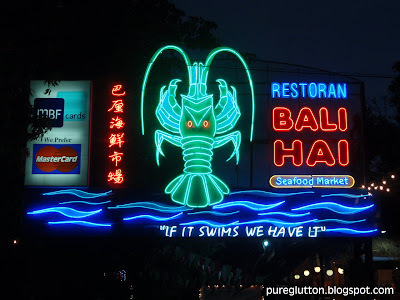 Anyway, this Bali Hai in Gurney Drive is a very popular seafood place, judging by the crowd there! They were tender yet succulent… and when married with the green & red chilli dips – fabulous! 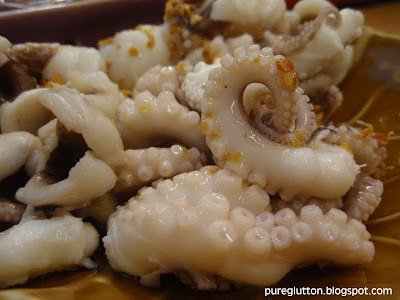 Since the light boiling method worked so well with fresh seafood, we had most of the dishes done that way. You can’t go wrong with this, believe me! The Tiger Prawns… they were swimming in the tanks before they were served (ok, I’m being gross) … Mmmm… they taste good dipped in wasabe+soya sauce too! What is a duck but not a duck? It doesn’t look like a duck…. … and it certainly didn’t taste like one! … or dip them in a pot of boiling herbal soup! I tried it both ways and I must say nothing beats eating it sashimi-style – that’s when you can really taste its sweet succulence. It’s slightly chewy, just slightly only, giving that delish bite to it… and then its smooth sweetness just burst upon your palate before slipping down your throat. 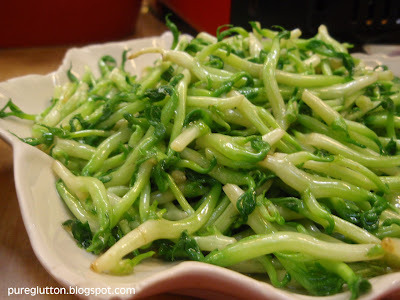 Ahh… let’s take a break from all those seafoody stuff and have some bites of greens… Pea Sprouts was our choice… lightly saute’ed with garlic… refreshingly yummy. The greens were to cleanse our palate… before the next onslaught. There were 2 disappointing items that night. The Garoupa… steamed with soya sauce… while the fish was fresh, unfortunately the cook left it in the steamer too long, so the poor fish was served overcooked! 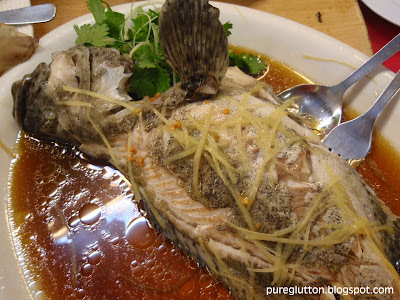 Quite a serious crime, I would say… coz that rendered the fish kinda chewy and somehow the taste went a bit off. The other big disappointment was the Seafood Fried Rice. LL, who is now an established Foodie, took 1 bite and promptly declared it “no wok-hei!! !” with a grimace. I took a spoonful and totally agreed with that statement. 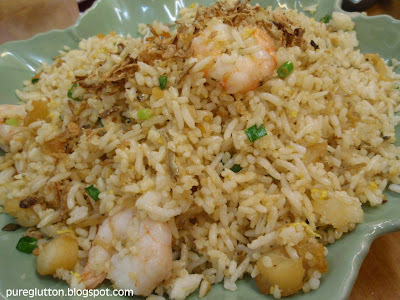 Worse, it was just mildly lukewarm when the dish was put on our table… the rice grains were kinda limp and the shrimps, scallops and anchovies could do nothing to revive the dead rice ….sigh. Anyway, by this time, we were all stuffed with the earlier dishes, so even without the carbs, we were pretty happy and satiated, hehe! 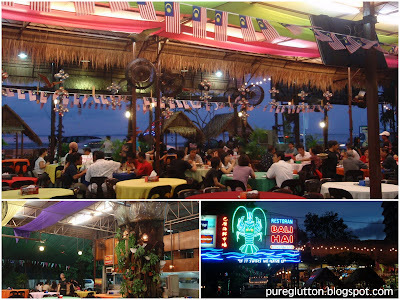 The restaurant was very much in the Merdeka spirit… and the tables were really filling up fast as our dinner progressed. 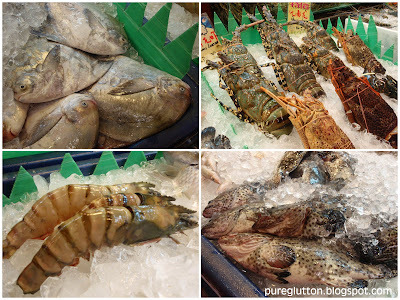 What can be more pleasant than digging into seafood, with the sea breeze blowing in, … and if the crowds were to quieten down a bit, I bet you can even hear the waves lapping, LOL! I kinda like their tagline “If it swims, we have it!” even though they didn’t totally live up to it! 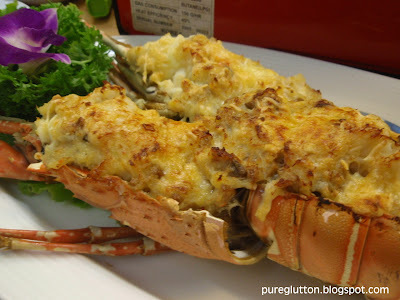 i was looking at the cheese lobster..
Hi Lady, I sure miss Penang and its fantastic food….oh chien, cockles dipped in chili sauce, poh pia….and all enhanced by the cool sea breezes at Gurney drive…. You keep well and have a pleasant week, Lee. Babe_kl: Ya i know Gurney Drive is kinda touristy 😉 but heck, we were local tourists! The whole stretch there is food paradise, tho' prices are on the high side. U.Lee: Thanks for dropping by 🙂 Go visit Penang soon, ya! now that's what I called FEAST!!! 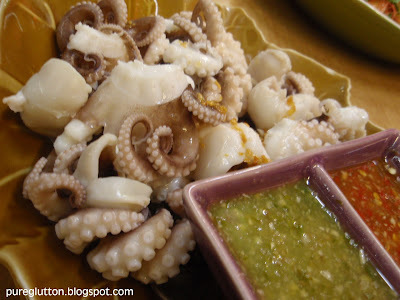 Hope to read more post on Penang soon.. don't tell me only Bali Hai ok? geoduck sashimi rocks! i think it's simply because freshness is guaranteed as it is cut on the spot. good stuff. 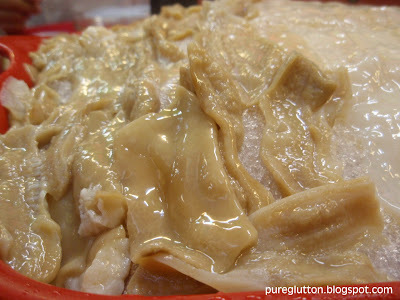 i love geoduck sashimi style! nothing bets that la. we drink the herbal soup on the side. snigger..
hey, i always pass bali hai only.. passer by.. hahaha.. never go in before cos i know it is too expensive for me la! 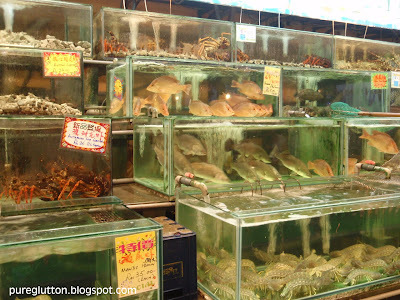 so the way u rank it, i dont hv to go too… any other outlet u can suggest good seafood? 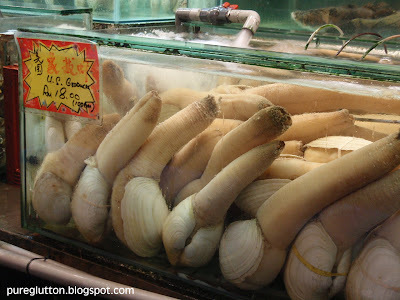 geoduck should be eaten raw, IMO. the cooked version tasted much much fishy-er (hehe, my term). Leo: Sure, stay tuned – more Pg posts coming up! Nic & Ciki: You are so so right! 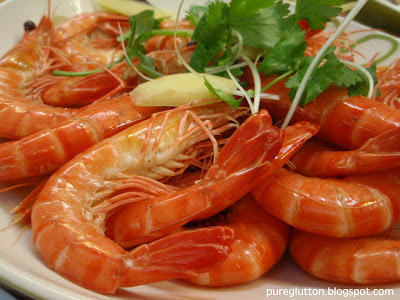 Claire: Look out for other Pg food posts coming up soon! J2Kfm: Correct – dip that in wasabe and you're good to go! 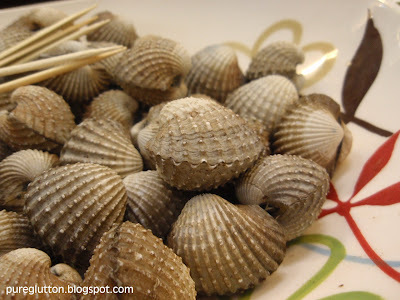 have not eaten cockles dip in chillies sauce for a long time-your photo of it looks so inviting! Foodbin: So you're another cockle-fan eh? the drunken prawn here was good..but its been a while since i last ate here..